Recommended to: Readers who want a new take on a post-apocalyptic world. One snowy night Arthur Leander, a famous actor, has a heart attack onstage during a production ofKing Lear. Jeevan Chaudhary, a paparazzo-turned-EMT, is in the audience and leaps to his aid. A child actress named Kirsten Raymonde watches in horror as Jeevan performs CPR, pumping Arthur’s chest as the curtain drops, but Arthur is dead. That same night, as Jeevan walks home from the theater, a terrible flu begins to spread. Hospitals are flooded and Jeevan and his brother barricade themselves inside an apartment, watching out the window as cars clog the highways, gunshots ring out, and life disintegrates around them. Beautiful. Though it feels odd to say it, Station Eleven was beautiful. It's hard to wrap my head around the fact that a book dealing with such a catastrophic event could be described that way. A plague that kills 99% of the population doesn't seem like something that could ever be beautiful. But it's the silence afterwards. The quiet. The little pieces of humanity that still exist in harmony. All of that is beautiful. Emily St. John Mandel has created this "after" world, and she's done it expertly. I remember a weekend, about a year ago, when all the electricity on our block went down. A transformer had blown, and it took a good 48 hours for them to fix. My husband and I lived by candlelight that weekend. We ate whatever we could that didn't need to be refrigerated, because opening that door meant possibly needing to binge on the food within. We read quietly in the fading light, and went to bed when it was too dark to see anymore. I remember thinking how beautiful the sky was over our apartment. It's amazing how many stars you can see when all those ambient lights aren't blotting them out. 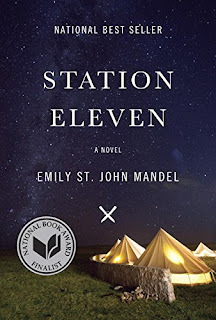 Things like this are exactly what Station Eleven is all about. Each character who graces us with their presence, has a story to tell about the before and the after. My eyes misted as they shared the things they always took for granted. The ability to send an email. To hear a loved ones voice over the phone. To fly up into the sky, and arrive somewhere hundreds of miles away in a few hours. This is a soft story. There isn't much violence, and where there is it is absolutely necessary. Instead, this is a story of remembrance. Of hope. Of preserving the good. There's not much else for me to say. In order to fully appreciate the depth that this story has, you'll need to experience it. What I can say, is that it made me revisit a part of myself I always ignore. The part that actually realizes how lucky we all are, but writes it off because that's just normal life. St. John Mandel reminds us not to take anything for granted. To live life with no regrets, and not as a sleepwalker. I needed that reminder, and I'm so thankful that I picked up this book.